Samsung's latest metal-framed Galaxy Tab S2 tablet comes in two familiar sizes, 8 and 9.7 inches, and is slimmer and lighter than its predecessor, the Galaxy Tab S. Both tablets use Samsung's own Super AMOLED display, and the resolution of both screens match Apple's iPad at 2,048x1,563 pixels. Overall, both the Galaxy Tab S2 models are ideal for watching movies. If want to get some favorite DVD movies to Galaxy Tab S2 for enjoyment on the go, you've come to the right place. This article will tell you how to convert DVD to Samsung Galaxy Tab S2 playable video formats so that you can enjoy them with ease. To finish the task, EaseFab DVD Ripper is highly recommended here. It can professionally rip DVD to Galaxy Tab S2, Galaxy Tab S, Galaxy Note, Galaxy S4/S5/S6, etc. supported video format with fast speed and excellent output quality. In addition, this DVD ripping tool can also convert DVD to various popular video formats like AVI, MP4, WMV, MPEG, MOV, FLV, MKV, 3GP, etc. as well as rip DVD to optimized video for playback on iPad, iPod, iPhone, Zune, Creative Zen, Archos, iRiver, Blackberry, Xbox 360 and more.If you are a Mac user, you can turn to EaseFab DVD Ripper for Mac (EI Capitan included), which has the same function as the Windows version. Get ready for the conversion? Just download the right version and follow the guide to import DVD movies to Galaxy Tab S2 with ease. 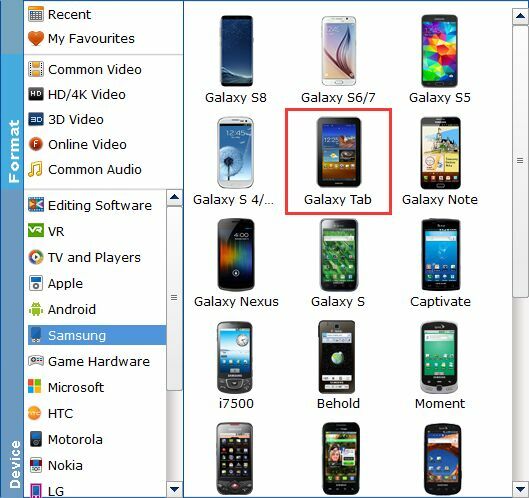 The ways to convert DVD to Galaxy Tab S2 on Mac and Windows (Windows 10 included) are the same. This below guide uses the Windows version screenshots. Just make sure you download the right version. Open the DVD ripper and click on the upper "Load DVD" button to browse and import the DVD movies you want to convert. All added files will be listed on the left source area. You can preview the DVD videos on the right viewing window and take snapshots of your favorite movie scenes. Tips 1: If you want to play DVD with subtitles, simple click Subtitles and select the one you prefer. You can also choose preferred audio track from the Audio drop-down lists. Next, select a proper output video format. this DVD converter provides the video profile for Galaxy Tab S2 so you don't need to be bothered by what format to set as the output file format. By choosing Galaxy Tab, you'll convert your DVD movies to videos with optimized settings to fit Galaxy Tab S2 8.0 or 9.7. Tips 2: If you like, you can click on settings you could easily set bitrate, frame rate, codec, channels, sample rate, etc to adjust parameters that affect video quality and file size for the video you prefer. keep in mind that bitrate higher results in big file size, and lower visible quality loss, and vice versa. When you have finished all the above settings, you can simply click the Convert button on the main interface and let the software do the DVD to Galaxy Tab S2 conversion for you. After the conversion, click "Open" to locate the converted video files and then transfer them to your Galaxy Tab S2 for watching on the go with ease.